One of my New Year’s resolutions is to stop ignoring this blog, so I intend to post at least one post a month. Let’s see if I can do better than last time. If I don’t, feel free to get on my case. I have been hearing about Mekong River for several years now and finally got a chance to check them out. I initially stopped by on a whim because I was craving fish, so I whipped out my smartphone, googled them while in the Beachwood library parking lot and called my carryout order in. I was surprised to find this place practically empty when I got there, although there was another woman waiting for her carryout order as well. She told me she and her husband get take-out from Mekong every week and recommended I try the Crystal Noodle Soup. I was not disappointed. I had ordered the Cambodian eggrolls and Tangerine Tilapia and liked it so much that I brought my mother there the next night to try the tilapia as well. She has dietary restrictions and I knew it would be perfect for her. She loved it too. It is bright and fresh and served with steamed broccoli. The fish is lightly fried and flaky and tender, and the tangerine is served in slices on top of the fish. I have noted that the in-house servings are larger than the carryout servings, so if you are hungry try to eat there. I also tried the Crystal Noodle Soup the second night, and it was delicious. The broth was light, and the cabbage was not overcooked and had a good bite to it. 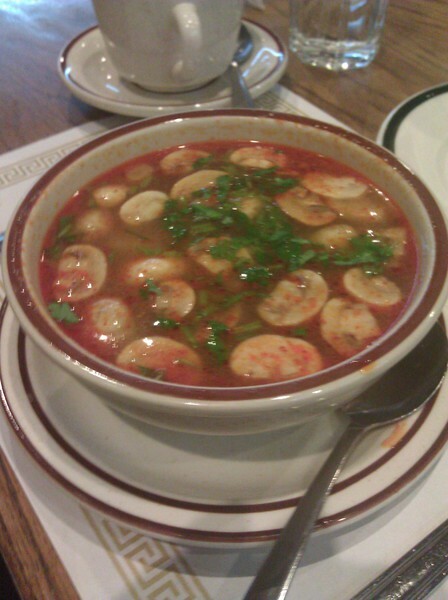 The pork was cooked perfectly, and the fresh cilantro on top really made the soup excel. 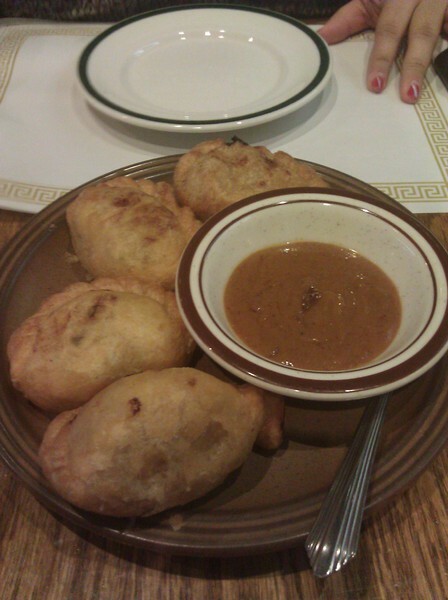 Several tips on Foursquare recommend the Thai Curry Puffs, and they are not wrong! The curry puffs are amazingly light and flavorful. I could easily eat these and the tilapia for the rest of my life and be blissfully happy. One thing to note about Mekong River is that the food is outstanding, but the service is lacking. I have heard several stories of bad service here, and witnessed it myself when my dining out group met there last week. 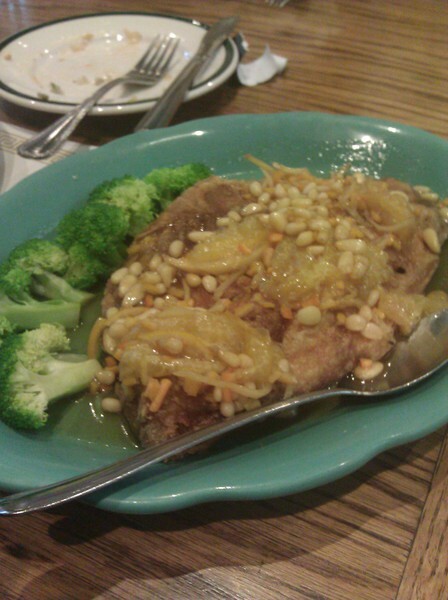 One of my members may or may not have ordered the Tangerine Duck instead of the tilapia. I didn’t hear him order, so I don’t know if he made the mistake or the waiter did. However, the waiter’s response was unbelievably rude. He got upset with us, gave the tilapia to my friend, and then no longer came out to serve us. I was left sitting there with no meal for about five minutes. The owner then came out asking which of us had ordered the duck and I responded that none of us had. The kitchen then proceeded to cook another tilapia for me, which I was given shortly before everyone was finished with their meals. Luckily everyone in our group shares their meals, so I did not go hungry and ended up boxing almost the entire entree to take home. We also had to ask for the Cambodian crepe after a while, because I was not the only person without her meal. I tried the crepe as well. 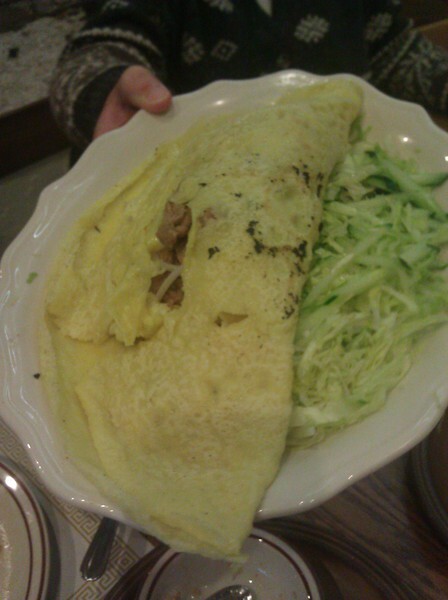 The crepe is an egg crepe, but it could have been more flavorful. I took a Viking Cooking School class on Vietnamese cooking, and the crepe we cooked there was much more flavorful. The crepe here seemed more like an omelette than a crepe. One thing I should note is that the place is freezing (especially the bathroom), so dress warmly in the winter. Or order tea and a soup to start to warm yourself up! The temperature of the restaurant and the service aren’t going to stop me from frequenting there, but I certainly won’t go there if I am in a hurry! Nor will I go there again with a large group. I think we’ll give it another try – the thai curry puffs look yummy.